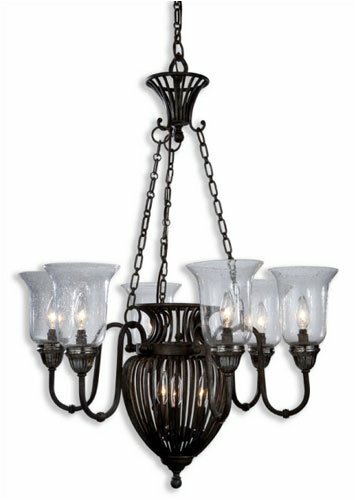 21016 - Uttermost Lisbon 9-Lt Chandelier. Charming and versatile, this groups fine iron ribs are the key to this classic collections appeal. The scattering of encased lights brings warmth to any room. Fixture Type: Chandeliers. Family: Lisbon. Designer: Carolyn Kinder. Number of Lights: 9. Wattage: 60W. Dimensions: 39.5 H (inches).